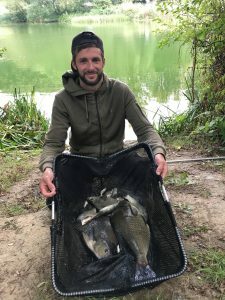 I was back at Dillington for the final Summer League match and Jake had one hand on the title as he was over 30lb ahead of Nick in second place but he wasn’t counting any chickens yet as the pond is more than capable of throwing up big weights. After breakfast, Nick announced the draw and I was hoping for one of the pegs on the bottom bank but wasn’t too disappointed to see I was on number 7 on the field side, it’s been a decent area in recent weeks. After the last match, my game plan was to feed two skimmer lines but fish shallow for roach, having a look on the longer lines every hour. So I set up a little Preston Chianti with spread shot to fish shallow, a 0.5 gram Drennan Roach for 10 metres straight out and a 4 x 16 Preston Chianti to fish two lines at 11.5 metres, one straight out and another angled to the left. For bait I’d mixed up around 2 kilos of Pro Natural Dark, Pro Natural Bream and Special G Gold the night before plus I had a two pints of casters, half a pint of red maggots, some dead reds, two tins of corn, and a pint of hemp. 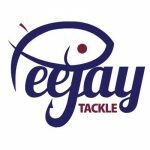 The other anglers in my section were Jake on peg 2, Dave on 5, Frank on 9 and Nick was on 13. Then Gordon was on 14 with Adie on 16, Terry ‘The Toast’ on 19, Fieldy on 20 and Stu on 21 were in the other section. The wind was quite strong and blowing straight into our bank which hopefully would be good for the skimmers. I was all set up in good time and even Frank was ready before the start this week! Nick got us underway and I cupped in a single ball of groundbait at 10 metres before potting in three on both the longer lines and finally a full cup of freebies over the top. I started on the roach line with the deep rig but it never even settled as a small fish took the caster on the drop. I had three in as many put ins before switching to the shallow rig. 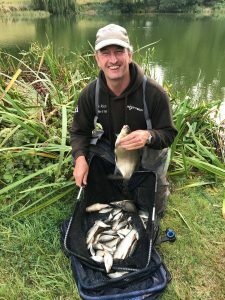 I was loose feeding casters and hemp and it was a bite a chuck, many small roach with the odd slightly better rudd. After around half an hour, I hooked a slightly better fish and as I shipped the pole back, I glanced behind me to guide it through the fence and when I looked back, my yellow hydro was stretched out for miles! I thought perhaps the fish had gone in some weed, so stuck the sections back on and pushed the pole out and it soon became obvious a big perch had nailed my roach. It plodded around for a bit and then stopped and suddenly a 3oz roach came flying out the water, the poor thing had hardly any scales left on it and I put the rather sad looking, bald roach in my net! Frank had caught some roach on the short pole to hand but was now on the feeder, I hadn’t seen Nick catch yet, Adie was on the feeder but saying he couldn’t get through the small fish and Fieldy was catching odd little roach. After an hour I had 43 fish for just under 3lb but was dying to try the longer lines, I gave it ten minutes on each line but no indications so I cupped in some more feed on both lines and went back to fishing shallow. Frank had a couple of smaller skimmers on the feeder and then Nick had two decent ones in quick succession. During the remainder of the second hour I had another 21 fish to put me on around 4lb but with Nick and Frank starting to catch skimmers I was going to need some better fish. 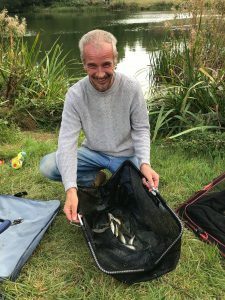 I had another look on my longer lines but never had a touch whereas Nick was catching skimmers regularly now and I’d also seen Adie net a couple of fish. I topped up the longer lines again before catching another 21 fish to put me on 5lb at the halfway mark. I was getting the odd better 3-4oz roach but they weren’t coming fast enough. 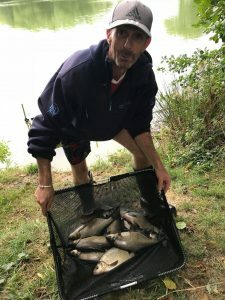 I had another look on the two longer lines but still no bites so went back to getting the odd roach and perch shallow and added another 20 fish to take my total to 105 fish for around 6lb. With two hours to go Hurf turned up for a walk round and said Jake had caught a couple of proper bream and some skimmers. I was fishing the left hand 11.5 metre line and finally the float sailed away, I struck and a fair bit of elastic came out, I shipped back gently and gratefully netted a nice 1.5lb skimmer. Back out and five minutes later, Hurf was just about to go and see how Frank was doing when the float went again and I had another skimmer of a similar size. No more bites so I cupped in some more feed and went on the other long line, after a short wait I had skimmer number three and this was getting interesting. I missed a good bite and then nothing for ages, I was just thinking about putting some more feed in when the float disappeared and another decent fish was on, this didn’t feel like a skimmer but a 12oz chublet was still very welcome. I shipped out again, the rig settled and the float’s gone straight away with my fourth skimmer. I had a fifth skimmer and missed a bite but was waiting longer for bites so I cupped in some more feed and went back on the left hand line. Nick and Adie were still netting odd fish but Frank was struggling now. No more bites on the left and my next fish came from the other line and was a nice little 8oz tench. With 45 minutes left, I thought I might get a few more but never had another bite. I packed up and took some of my kit part way round the pond, I was talking to Nick when Jake arrived with the scales, he pulled his net out and had some nice skimmers for 17lb 12oz which wasn’t as much as I thought he’d had and then Frank had 6lb 3oz which included some 2-4oz skimmers so they’re obviously breeding which is a great sign. Frank likes having his photo taken almost as much as Adie! As we walked to my peg, they asked what I had and I said around 12lb and was pleasantly surprised to weigh 15lb 4oz and was left rueing the two bites I’d missed on corn but then again Nick had lost five skimmers. 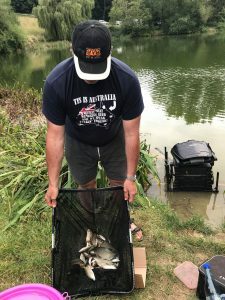 Dave had struggled for 12oz but said he’s enjoying getting back into it, Jake was admitting to 10lb or so and when he pulled his net out, he had two lovely big, dark bream plus skimmers and roach for 12lb 12oz. As we gathered round the other side, Adie was the top weight in the other section with a level 15lb of skimmers, roach and a 2lb chub, Fieldy was second with 4lb 12oz and then for the second week running Gordon and Stu both had the same weight, 4lb this time and Terry ‘The Toast’ weighed 3lb 6oz. 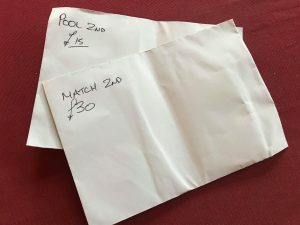 So I’ve finished in second place and picked up £45, another really enjoyable day and my game plan worked quite well, I think 10-12lb of roach is possible if you fished shallow all day but that’s not quite enough, would I have caught more if I’d have just fished for skimmers all day? I’m not sure as I didn’t have a bite on corn until two hours from the end and even then I never had a fish in the last 45 mins. I suppose in hindsight (that wonderful word again! 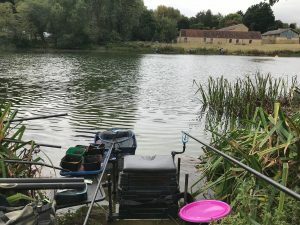 ), if I’d have fished for roach in that last period I might have done enough but I thought both Nick and Adie had more than they did and I needed skimmers to challenge them. 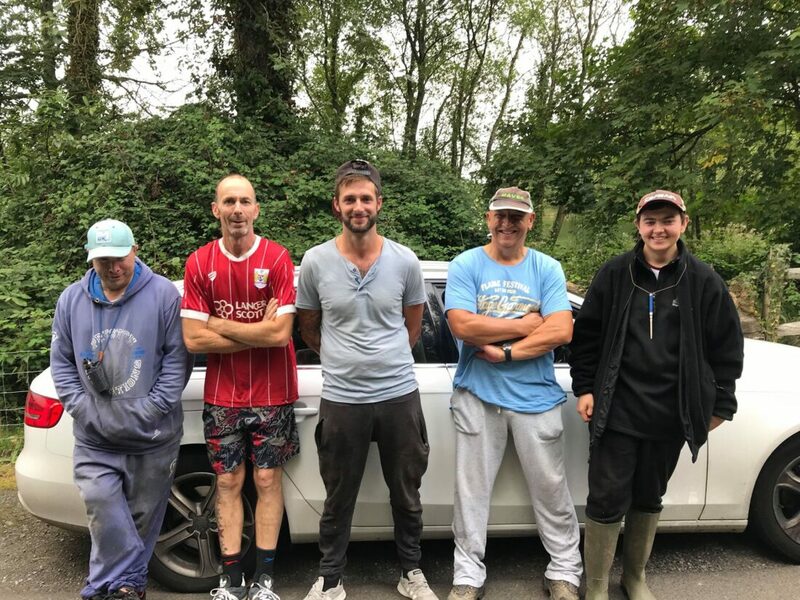 The club would like to say a massive thanks to Nick Payne for running the league, Ilminster Bowling Club for looking after us in the mornings and last but not least all the anglers who make it such an enjoyable day out. Just a couple more things before I go, with the river matches starting soon Hurf is organising a swim clearing session at Isle Brewers this evening (Weds 19th September), meeting at the bridge at 5:15pm, all and any help welcome. 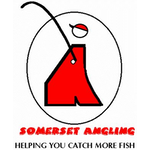 And don’t forget the first river match is on 7th Oct against Taunton AA on the Tone.